all year round ever-red colour. We are constantly on the lookout for great garden plants, which are easy to grow and make a great addition to any garden - these fabulous Photinia tick both boxes. 'Little Red Robin' is quite a new cultivar with smaller leaves, giving an even bolder and brighter red glow as the new leaves emerge and throughout the summer. What's more, in this stylish lollipop standard form, it's even more of a year-round focal point and feature too. Skilfully crafted over 4 years, this unusual format adds height to any garden, and yet is easy to maintain with a simple trim to shape each autumn. 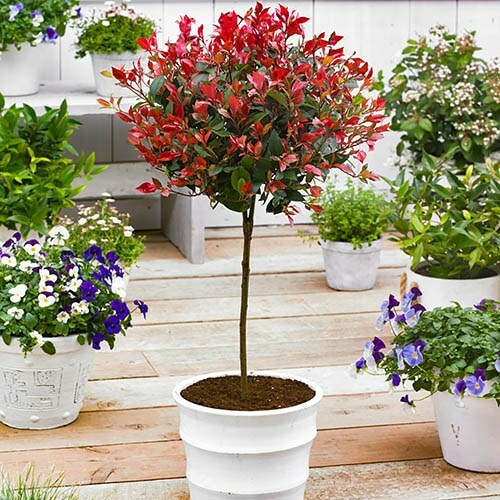 Grow in full sun for best red foliage colour and it will glow on those long summer nights. Whilst it will fade to darker green somewhat over winter, it retains a mix of red tones all year. Great for year round evergreen use (it should be ever-red! ), they work well in pairs in large pots either side of doorways, gates and porches, or as a single focal point in a formal bed. Supplied as a 4 year old tree, 0.8-1m tall in 3L pot, with 50cm clear stem, and shaped standard head. Red leaf colour at it's best in new Spring growth and in full sun.